Manual trimmer with a fixed blade cutting head in hardened steel for cutting Foam (maximum thickness 30mm) and Forex (maximum thickness 3mm).Blade adjustable in height from 0mm to 30mm. Spare blades included.Provided with reference guide, sheet holder and stand with adjustable supports to compensate for any uneveness of the floor. 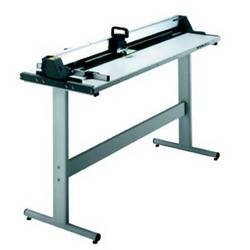 Usable cutting length 125cm.Optional laser ray.